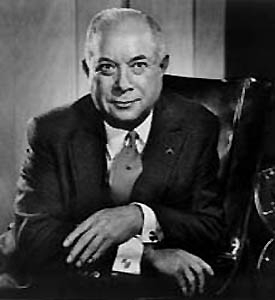 David Sarnoff was a Russian immigrant who came to America when he was 9 years old. Even at the tender age of 9 Sarnoff displayed his entrepreneurial spirit while selling newspapers on the street. He taught himself English from the papers and owned his own newstand by the age of 14. At the age of 15 Sarnoff was forced to abandon his newstand in search of full time work. He was hired as an office boy at American Marconi Company and quickly worked his way up the ladder. When he was 17 he was Marconi's personal messenger and a junior wireless operator. His assent up the corporate ladder didn't end until he was president of RCA and owner of his own company, NBC. One of Sarnoff's claims to fame is that he was one of the few wireless operators who reported the Titanic disaster to the nation. Even though his claims that he was the only operator have been refuted, it was undoubtably an event that changed the way America looked at wireless. Sarnoff was one of the few to realize the significance of Armstrong's radio. He made radio available to the masses by selling thousands of them through RCA. Even though he was not an inventor, his influence on radio is of great significance. He is responsible for making radios a common household item.